Winter is almost over and that means sudden changes in weather and water on ice. Ice conditions are quickly changing and flooding could become a problem as we enter into Spring. Outdoor enthusiasts including fishermen need to pay attention to these changes. Storms can happen quickly so fishermen or fisherwomen need to keep in touch with the weather service and let others know where they are for safety sake when out and about. Enjoy yourself but remember alcohol alters your judgment. So use it sparingly while enjoying the outdoors. Keep an eye on the weather as conditions such as temperature, wind, fire and precipitation can come in with fierce strength. This report is compiled on Monday and Tuesday and reflects conditions and results of fishing from the past week. If you wish other information feel­­ free to contact most parties for current daily information. Good luck fishing from the Montana Outdoor Radio Crew. Word has it snow drifting and ice conditions are changing. At Rock Creek the week before you could only get to the cleaning station so you had to park there. There are lots of drifts on the lake. The drifts even with warm weather are still there. They went in on the north side as it is the only way you can get in. *** Monty is still available to make reservations for spring by calling 1-406-465-0241 and he can set you up. He has the book with him. “We have closed the Marina as of October 1st, 2018 for the season. The Marina number will not bring results at this time. “Monty says. Neil is recovering . Due to his health they will not be up at Rock Creek. At this point Linda has no idea when they will be back at Rock Creek. So there are no services there. Remember to check your regulations for the information for this region about what minnows you may use on Tongue. There are no reservations needed for camp sites it is now first come first take. Everything is shut down like the electricity and water. The cleaning station has been closed. There are sites still open at Campers Point #1 to 11 and have electric hookups on year round. “ . Eddie reports, “ There is water on the edges. The ice is still holding and 12 to 20 inches deep. Lake trout are biting but one day good and the next day slow. Walleye and northern pike are on the slower side fishing. Fishing seems to be best for lake trout at Shaft house, Bear Creek, York Island and Hacksbee. If you bring a 4 x4 or a side by side you will need chains on the vehicles with the snow being so deep. Snowmobiles are the best choice. The ice is holding right now and is +insulated by the snow. Do not assume ice depths are all the same. Just be aware. You can call us at 406-526-3442 for details on the ice. Scott reports,” Guys are picking up walleye and northern pike in the bays. They are not aggressive. The edges are starting to soften up. There are also slush pockets. Which are deeper because of the higher temperatures. The temperatures at night are cold so it freezes up during the night. Lake trout fishing is improving. Use extreme caution as temperatures warm up. There is not much snow left. We do have ice fishing tackle here if you need any. Word has it from others the surface of the ice on Cooney is slushy. The ice has had a lot of snow on it but the warmer temperature is altering that. Conditions are changing daily. Campground is open. The drinking water has been shut down for the winter. Our electric is on year around. The North shore campground is now closed. 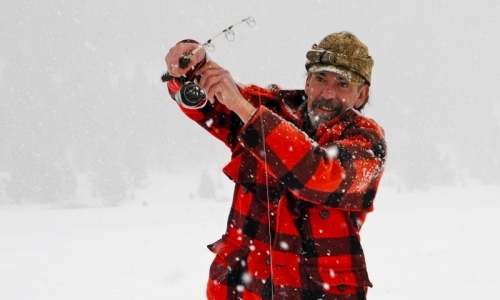 Mike says, “Fishing has slowed down but there are people out on Elmo right now ice fishing (Wednesday). It has slowed down some. There is some snow on the ice still. People need to know that the West Rosebud Isle Fishing Access is closed. That is the one in Fishtail. There is an ice problem and now flooding there so it is not safe to enter which is why it is closed,” Mike says. Pat says,” We did see fishermen on the ice this week. They even built a snowman. It has been windy and cold this week. We still have a foot of snow. The roads have been plowed.” Deadmans has over 10 inches of ice some have said. Colby reports , “At Spring Creek the fishing is good. Someone caught 3 but the biggest problem is access. In other words getting through the snow to get to it is tough. Achley- We have heard it has been poor fishing. Only a few fish caught. The ice is 1 foot deep. Drifts on the road if the wind blows can be a problem. At the East Fork they are catching perch. Not in numbers but some. When you can get to Crooked Creek I suggest you bring minnows if you have them. I do have some bait but not a lot so I suggest people bring some. When open Slim is at the marina full time now. He is open 7am to 7 pm Wednesday to Monday. He will be closed on Tuesday. If you have questions call Slim at 406-366-6313 and leave a message. The Marina is open. Hours are 7 am to 7 pm. The Flamingo has closed for the season. Jim reports,” On Nelson the ice is still good. People are using 4 wheelers. It still is hard to get around. They are catching perch. On Forchette I know the road is clear. There is some water on the ice so it does have slush. I do have larger minnows for sale right now. We also have ice fishing supplies. Shop hours are 8 to 6 Monday to Saturday and closed on Sunday. Jayce reports, “ Tongue- People have said that at Tongue the ice has pulled away from the edges. You could still get on walking through water. They caught a few crappies but it was slow. Big Horn I am being told the Big Horn has fished okay. It has not been hot or heavy fishing. The guys were using sow bugs and small midge patterns. I was near Paradise Valley and the water was not crystal clear more cloudy green which surprised me. Rich says,” Everyone is waiting for the snow to go. Madison- I talked to one guy who fished the Madison. It was open water and slow. Holter- I have been told Holter is treacherous because of the snow. There is a lot of snow. There are pressure ridges and slush on the ice. You cannot tell where they are and there is not a lot of ice in some places. The shop is closed right now except by appointment. Our hours are 8 am to 12 every day. Riverside Anglers in West Yellowstone : Alice Owsley, fishing guide and outfitter 406-640-1698. “Despite all the snow, we still struggle to get to the river, the gorges are barely loosening up around here. Madison flows have come up in the last week. Expect fish to rise to eat midges once the clouds return. In the meantime fish will eat nymphs, a larger stonefly with a smaller midge pattern below. Streamer fishing will be good when the sun is off the water. ” Alice says. All fishing in Yellowstone is closed until 2019.